Tonight on the Special Eviction Episode we find out the actual results of what has transpired over the last couple days. Big Brother has blocked the live feeds since 11am yesterday morning to keep the eviction and HOH competition a secret until tonight’s television broadcast episode. Unconfirmed spoilers of the results were leaked last night after the episode was taped and tonight we find out if those results were true or false. UNCONFIRMED Rumored SPOILER RESULTS of the Special Eviction Episode! Although the Special Eviction episode is set to air Wednesday September 11th – there are already unconfirmed spoilers leaking out about what happened during the episode. As everyone who has been following our live feed updates and watching the feeds the last few days knows that JUDD’s fate was pretty much sealed. His attempts to save himself came off more desperate and annoying to the other house guests as most of his time was spent badgering the other house guests repeatedly for assurance that he was safe to the point that Spencer, McCrae, and Andy tried to avoid him. As a last ditch effort Judd said a speech during the Veto Ceremony in a fake attempt to get McCrae mad at him so that Andy and Spencer would want to keep Judd in the house as a bigger target. 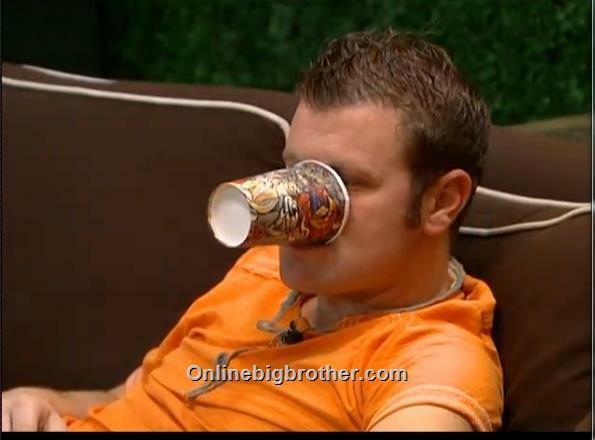 It was a failed attempt that didn’t work and only made Judd look more desperate. Both Spencer and Andy lied to Judd telling him he was 100% when they knew they wanted him gone over Ginamarie. Andy planned to break the news right before show or during the first commercial break that Judd was being evicted. JUDD comes back from the diary room. 7:30pm Andy and McCrae are sitting out by the hot tub. Andy asks if McCrae is okay? McCrae says he is just super nervous. I just feel like I need to win that HOH tomorrow or I am going home. Andy asks why, I wont send you home. McCrae says yeah but if you win HOH and Gina wins veto then I’m going home. Andy asks who do you miss most other than Amanda? McCrae says the old Judd. Andy says he misses Helen. McCrae says yeah me too, although I didn’t talk to her much. Andy says other than Helen, you four will be the people that I will keep in contact with the most. Hopefully people will be forgiving. McCrae says he thinks people will. Andy says hopefully Elissa doesn’t poison me with my true love Ragan Fox. That ship might have sailed. McCrae says he thinks he knows better than to listen to them. McCrae tells Andy if I don’t win HOH, it’s going to be a real tough battle for the veto. Andy tests McCrae on his knowledge of the days things happened in the house. Andy says if Ginamarie walks out here I am going to lose my s**t! I can’t get a minute alone with you! 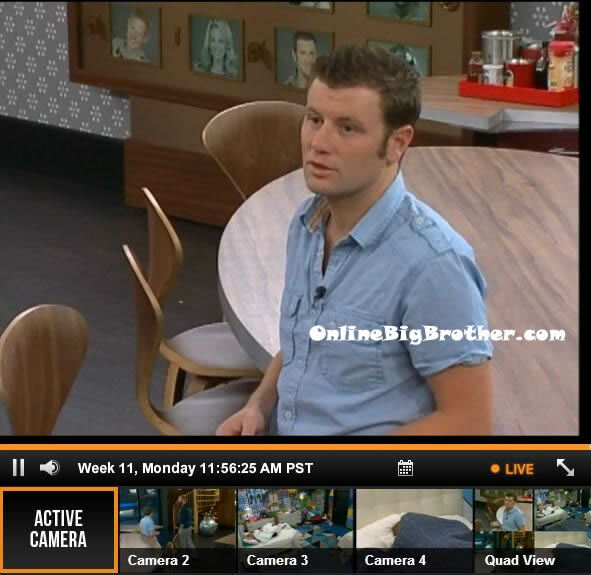 3:30pm Up in the HOH room – Judd asks Ginamarie do you know if its me or you? Gina says I don’t know dude because I am not putting anybody on the spot. I just asked if they would let me know so that I can put a dress on if I am going out. Although with my scar I will probably just wear pants. Gina comments how she has been looking at the fish food to figure out the finale is on the 18th because that’s when it runs out. Gina says tomorrow there’s an eviction and then probably an HOH right after that. So basically there is only one more week. 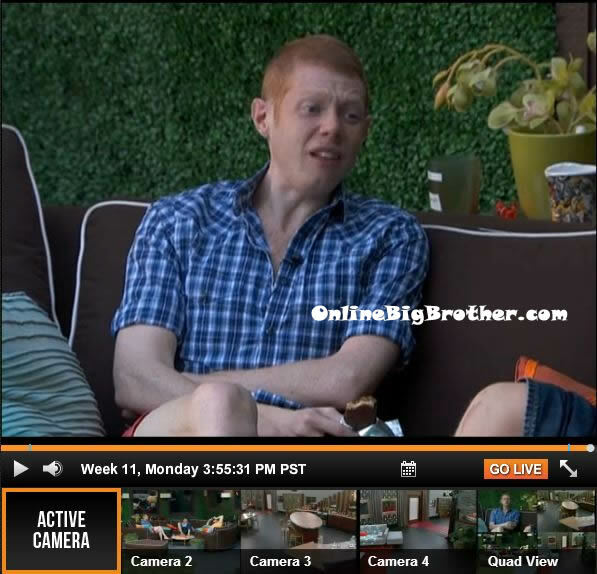 3:35pm Out in the backyard – Andy and McCrae are talking. McCrae says that Judd told him if he was in the jury he would vote for Spencer to win because of what he’s gone through. McCrae comments that it is pretty amazing that Spencer has survived so many times on the block. 11:55am – 12:15pm Judd and Spencer are in the kitchen talking about it being weird that the luggage is already in the storage room. Judd wonders if he is supposed to pack now or what? He says they haven’t even shown the veto meeting episode yet. Judd wonders if he should go ask if he is supposed to pack now or what? Spencer says it would be a good idea to ask. 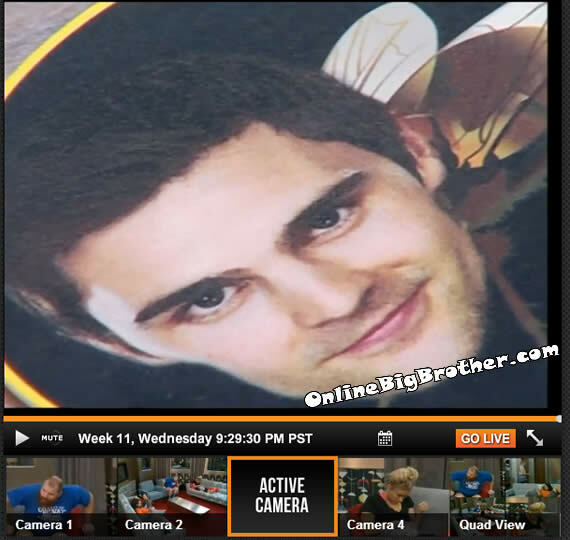 Spencer heads up to the HOH room. 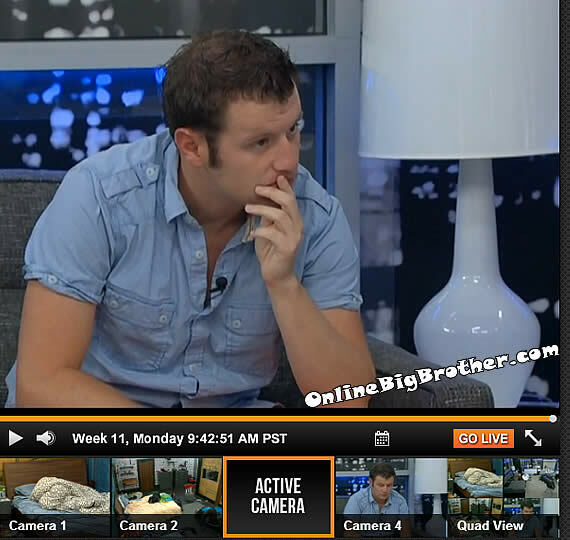 Judd goes to the diary room to ask if they should pack. When he comes out he heads into the rainbow room. Ginamarie asks Judd what they said. Judd says they didn’t know and said they would let us know later. 12:20pm Spencer is called to the diary room and when she comes out instead of going back up to bed in the HOH room he gets into his old bed downstairs. Andy wishes there was a way they could guarantee GM not win the HO. Andy is certain that GM would vote out JUDD. Andy leaves to go talk to GM. 7:29pm Backyard the boys McCrae says his mom pays for his cell phone otherwise he wouldn’t have one. He usually just uses his tablet and find a free wifi hot spot. Andy is shocked he doesn’t have a iPhone, JUDD says McCrae needs to get one after the show. MCCrae doesn’t see the point because he can do everything with his tablet. Spencer says he doesn’t have a iPhone he has the Nokia windows phone and he really likes it. MG says it was optional they didn’t have to. Chatting about the jury votes. JUDD jokes that Andy is this years Shelly. Andy says that was his plan all along. JUDD – “She looks at it like that she’ll look at it like I kissed a racist”. Andy says Aaryn has probably told everyone in the jury house she kissed JUDD. THey mention that one of the people filming in the walls wears high heels and she always walks around at 4am. 2:20pm Judd finishes his lunch, folds more laundry, shaves and treats his wounds with Purell. Judd then heads up to the HOH room door again and knock but gets no answer so he goes back downstairs. Judd goes back to pacing around the house. Judd then grabs his blanket and a few pillows and makes it look like he is sleeping in the hammock. He then goes back inside and grabs his hat and a vase for a head. He then adds shoes. Judd the heads back inside and talks to Andy who is now up. Judd looks out side and wonders if it’s Spencer outside. Andy says wait that’s Spencer. Judd says yeah he was doing laundry a minute ago.